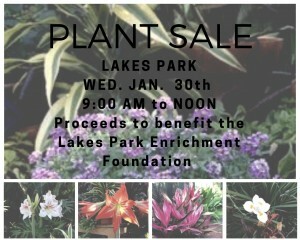 The Lakes Park Enrichment Foundation will host a plant sale in the Lakes Park Botanic Garden, Wednesday January 30th, 2019 from 9:00 AM to Noon. The sale will take place in the propagation and potting area of the Botanic Garden. Proceeds to benefit the Lakes Park Enrichment Foundation. The Foundation’s mission is to enhance the beauty and experience of Lakes Regional Park. Volunteer gardeners have propagated and carefully nurtured dozens of plants. Gardeners use cuttings from plants in the Lakes Park Botanic Garden. Seasoned gardeners will be on hand to help with plant selection and answer your questions about gardening in Florida. Email Info@LakesPark.org if you are interested in volunteering.